Also known as Optometric Vision Therapy, Behavioral Optometry and Visual Training, this is a method of personalized treatment that can boost visual performance and thereby prevent the progression of many vision-related learning disorders. Generally, a trained vision therapist customizes weekly sessions that last 45 minutes each for a few months. A variety of specialized instruments are used in exercises to strengthen different pairs of the brain that help to coordinate functional vision. We may utilize tools such as wands, beads, balls on a string, custom-designed charts, prisms and lenses. Your child’s vision therapist will assign a series of exercises to be done at home in between sessions, and these are essential for successful treatment. Once it is determined that vision therapy sessions are no longer necessary, we will provide your child with instructions for a maintenance program of eye exercises. We will also schedule regular follow-up sessions in order to keep an eye on any new symptoms or changes. If necessary, supplementary sessions will be recommended. How do I know if my child needs Vision Therapy? If you or your child notice any of these signs, contact us for a pediatric eye exam in one of our optometry offices, located in Citrus Heights, Rocklin, Gold River and Folsom, CA. 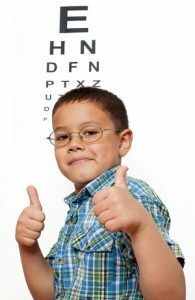 We’ll evaluate your child’s eyes thoroughly to see if there’s a need for Vision Therapy. Don’t let vision problems get in the way of learning!